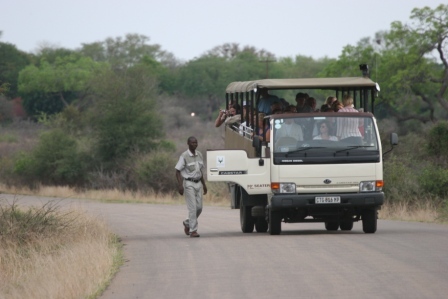 Each evening from almost every camp in the Kruger Park, the South African National Parks provide 'on road' night game viewing drives in 20-seat open sided vehicles. A SANParks game ranger armed with a .458 rifle conducts the night game drives. The night game drive departs from camp at 18.00hrs and last for approx three hours. You may have a chance of using one of the three spotlights on the vehicle. It is your opportunity to see some nocturnal wildlife in the Kruger Park. The night game drives are a very enjoyable experience. 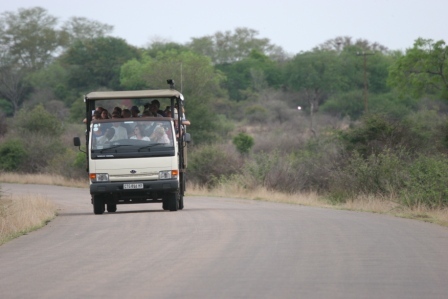 When you book any one of our Kruger Park safaris, we automatically allow for one night drive per person. If you are interested in more than one night drive we will book the extra night drives on your behalf but payment is to be made directly to SANParks when you check into camp. The cost is approx R 200.00 per person. At night the predators are more active, so going on a night drive increases your chance's of seeing either a pride of Lions on the move or a Leopard out hunting. If there is no availability to include you on a night drive we will book up a sunset drive in lieu of the night drive. Children under 8 are not always allowed on night drives. If you still want to experience a night drive your Safari Ranger will of course look after your children at camp. It's not a problem at all and we provide this service all the time. You are welcome to take snack food and cold drinks with you on your night drive. A toilet and cigarette break normally happens at the middle of a bridge crossing, approximately half way through the drive.